Biliary, plasma, and urinary disposition of paclitaxel and paclitaxel metabolites were determined simultaneously in a patient with percutaneous biliary drain. The complete chemical structures of the major metabolites were established by mass spectrometry and NMR spectroscopy. A nonlinear elimination model was indicated by the fact that the rate of biliary excretion of paclitaxel rose as plasma concentrations fell. Dihydroxypaclitaxel was the predominant biliary metabolite, in contrast to the barely detectable levels in two previous patients. This derivative results from hydroxylation at the C6 position of the taxane ring and at the phenyl C3′-position on the C13 side chain mediated by cytochrome P450 2C8 and 3A4, respectively. In line with this mechanism, the two other main metabolites corresponded to 6α-hydroxypaclitaxel and to the paclitaxel derivative hydroxylated in the para-position on the phenyl ring at the C3′-position of the C13. A high CYP3A4 activity in the patient is consistent with the repeated administration of methylprednisolone for 14 days before paclitaxel treatment, a compound known to induce the CYP3A isoform, and with the increased ratio of 6β-hydroxycortisol/cortisol in urine, an index of CYP3A activity. These findings emphasize the influence of pretreatment with corticoids on the disposition of paclitaxel. Paclitaxel has a significant clinical activity against a broad range of tumor types including breast, lung, head and neck, bladder, and platinum-refractory ovarian carcinoma (Rowinsky, 1997). Accurate information on the disposition and metabolism of this drug would help optimize administration. Pharmacokinetic studies performed at the plasma level have demonstrated that its disposition is well characterized by either biexponential or triexponential models, whereas renal excretion of parent compound accounts for less than 14% of the total administered dose (Rowinsky 1995, 1997; Sonnichsen and Relling, 1994; Walle et al., 1995). The primary route of systemic elimination of paclitaxel occurs via hepatic metabolism and biliary excretion, which may account for the marked interpatient variability in systemic clearance (Monsarratet al., 1993; Sonnichsen et al., 1995; Walleet al., 1995). In a previous study, we characterized the main hepatic metabolites in the bile of a patient; among the five hepatic metabolites detected, 6α-hydroxypaclitaxel was the major metabolite, p-hydroxyphenyl-C3′-paclitaxel constituted a minor metabolite, and dihydroxypaclitaxel was barely detectable (Monsarrat et al., 1993). The quantitative predominance of 6α-hydroxypaclitaxel has also been described by Harris et al. (1994a) in the bile of another patient. These metabolites have also been detected in human plasma and feces (Gianni et al., 1995; Royer et al., 1995; Sparreboom et al., 1995; Wright et al., 1995). Two cytochrome P450 isoenzymes are involved in the biotransformation of paclitaxel by human liver microsomes (Cresteil et al., 1994; Harris et al., 1994b; Kumar et al., 1994; Rahman et al., 1994). The formation of the major metabolite, 6α-hydroxypaclitaxel, is catalyzed by CYP2C81 (Cresteil et al., 1994; Rahman et al., 1994), whereas the minor metabolite, p-hydroxy-phenyl-C3′-paclitaxel, is formed by CYP3A4 (Cresteil et al., 1994; Harris et al., 1994b; Kumar et al., 1994). It is assumed that the dihydroxylated metabolite resulted from stepwise hydroxylations at the two previously described sites (fig. 1) (Cresteil et al., 1994; Harris et al., 1994b;Wright et al., 1995). Systemic elimination of paclitaxel has been demonstrated to be saturable in vivo (Huizing et al., 1993; Rowinsky, 1997; Sonnichsen et al., 1994), and neutropenia has been shown to be related to plasma concentration (Beijnen et al., 1994; Gianni et al., 1995;Kearns et al., 1995; Rowinsky, 1997). Marked variability in paclitaxel metabolism may stem from interindividual differences in cytochrome P450 activity and drug-induced interactions (Berg et al., 1995; Cresteil et al., 1994; Harris et al., 1994b; Jamis Dow et al., 1995; Royer et al., 1996; Schlichenmeyer et al., 1995; Sonnichsenet al., 1995). Metabolic pathways of paclitaxel biotransformation in human. We report the disposition and metabolism of paclitaxel in a cancer patient with a biliary percutaneous drainage. In contrast to the two previous cases studied, plasma, bile and urine were simultaneously collected during the treatment. The metabolic profile of paclitaxel in bile and plasma was qualitatively and quantitatively different from those recorded in the two previous patients (Harris et al., 1994a; Monsarrat et al., 1993). A 60-year-old female patient had a tubular subtype breast cancer with disseminated metastases on ovary, liver, and in the retroperitoneal space. Paclitaxel (Taxol, Bristol-Myers Squibb) was administered as a 3-hr iv infusion at a dose of 135 mg/m2 (243 mg) following premedications with methylprednisolone (200 mg per os), cimetidine (300 mg iv), and dexchloropheniramine (5 mg iv) for prophylaxis of hypersensitivity reactions. In addition, the patient had a subacute bowel obstruction in relation to her metastatic disease and also received methylprednisolone (40 mg per day per os), neostigmine (0.5 mg per day subcutaneously), and tiemonium (20 mg per day im) for 2 weeks before administration of paclitaxel. Plasma γ-glutamyl transpeptidase and alkaline phosphatase levels were 11- and 3-fold the upper normal limits, respectively. Total bilirubin, aspartate transaminase, and alanine transaminase levels were within normal limits. The ratio of 6β-hydroxycortisol/cortisol, used as an index of CYP3A activity, was determined by the HPLC method requiring 1 ml of urine (Lykkesfeldt et al., 1994). Bile, Urine, and Blood Collection. The patient gave informed consent for the sampling protocol. Bile was collected through a percutaneous biliary cathether that was originally implanted to drain an obstructive cholangiocarcinoma. 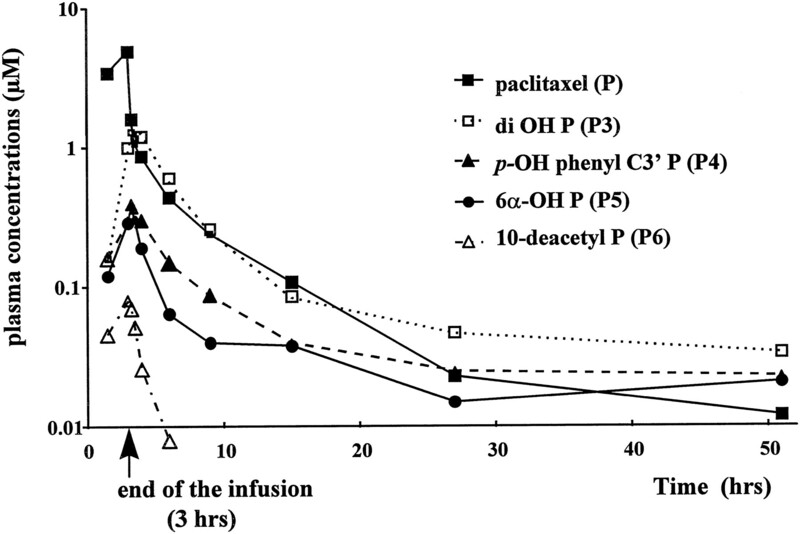 Bile was sampled prior to paclitaxel treatment and then continuously during the infusion period (80 ml) and in six fractions following the end of infusion: 0–1 hr (25 ml), 1–3 hr (60 ml), 3–6 hr (75 ml), 6–12 hr (160 ml), 12–24 hr (350 ml), and 24–48 hr (650 ml) after the end of infusion. Five-milliliter blood samples were obtained from the no-infused arm, before infusion, at the middle and the end of infusion, and 0.5, 1, 3, 6, 12, 24, and 48 hr after the end of infusion. Blood samples were centrifuged immediately after collection, and the plasma was removed. Urine was collected in four timed-collection periods corresponding to 0–6 hr, 6–15 hr, 15–27 hr, and 27–48 hr after the start of the infusion. Bile, urine, and plasma samples were stored at −20°C until analysis. Purification of Biliary Metabolites for Chemical Characterization. Pooled bile samples, obtained from different timed-collection periods, were extracted and purified according to previously reported method (Monsarrat et al., 1990, 1993). The purity of all metabolites (>96%) was checked with HPLC using a diode array detector before structural identification by mass spectrometry and nuclear magnetic resonance. Bile, Plasma, and Urine Sample Preparation for Pharmacokinetic Analysis by HPLC. Bile samples (1 ml) were spiked with 10 μl of internal standard (docetaxel, 1 mM) and extracted twice by addition of 4 ml of diethyl ether, shaken for 20 sec, and centrifuged at 2000 rpm for 5 min. The ether fraction was evaporated, and the residue was dissolved in 200 μl of 70% methanol. Paclitaxel and paclitaxel derivatives were extracted from plasma and urine by a solid-phase procedure using C2 Bond Elut cartridges (Analytichem, Harbor City, CA) eluted with 3 × 1 ml methanol and 3 × 1 ml 10 mM ammonium acetate, pH 6.0. Before addition of the internal standard (docetaxel, 10 μl at 10 mM) to plasma and urine samples (1 ml), contaminants were washed out successively with 3 × 1 ml 10 mM ammonium acetate and 3 × 1 ml 35% methanol. Paclitaxel and paclitaxel derivatives were then eluted in 2 × 1 ml 80% methanol. After evaporation, the final residues were dissolved in 0.2 ml 80% methanol (recovery of 90–95%). The chromatographic analysis was conducted as previously described (Monsarrat et al., 1993; Royer et al., 1995). Paclitaxel, 6α-hydroxypaclitaxel,p-hydroxyphenyl-C3′-paclitaxel, dihydroxypaclitaxel, and 10-deacetylpaclitaxel were quantified from linear calibration curves obtained with pure reference compounds. The HPLC-mass spectrometry system (LC/MS) was performed as published (Royer et al. 1995). The nuclear magnetic resonance spectra were recorded in a Brucker 400 Mhz spectrometer (Wissembourg, France) after solubilization of the compounds in deuterated methanol/chloroform (5:95). The absence of glucuronide and sulfate derivatives of paclitaxel in human bile and urine was checked as described (Monsarratet al., 1990, 1993). Paclitaxel, used as reference, was obtained from Bristol-Myers Squibb through the National Cancer Institute. Baccatin III, 10-deacetyl baccatin III, and docetaxel (used an internal standard) were obtained from D. Guénard (CNRS, ICSN, Gif/Yvette, France), 10-deacetylpaclitaxel was prepared as previously reported (Royeret al., 1995). Cortisol was purchased from Sigma, and 6β-hydroxycortisol was obtained from Steraloids (Wilton, NH). All compounds were more than 99% pure by HPLC analysis. The plasma concentrations of paclitaxel and paclitaxel metabolites were analyzed using the SIPHAR pharmacokinetic program (Simed, Créteil, France) according to 3-compartment and 2-compartment linear models, respectively. The areas under the plasma concentrationsvs. time curve (AUC) were obtained using the trapezoidal rule, and the plasma clearance of paclitaxel was calculated by extrapolation to infinity. The overall biliary clearance of paclitaxel was calculated by dividing the cumulative biliary amount of unchanged paclitaxel by the cumulative plasma AUC of paclitaxel 48 hr after the end of infusion. To study the time course of this parameter (e.g. biliary clearance of unchanged paclitaxel) over the 48 hr following administration, the biliary clearance of unchanged paclitaxel was calculated for each period of collection of bile by dividing each rate of biliary excretion by the mean plasma concentration over this interval. The latter value (e.g.mean plasma concentration) was obtained by dividing the trapezoidal AUC during the time interval by the length of the time interval (Rowland and Tozer, 1989). 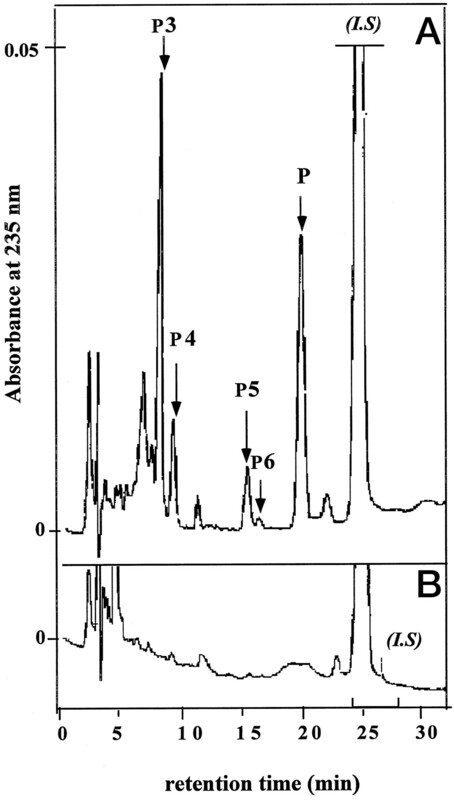 The HPLC chromatogram of human bile (fig.2) revealed, apart from paclitaxel (P), ten peaks absorbing absorbing at 235 nm, the maximum absorption wavelength of paclitaxel and its derivatives. Structural identification using HPLC chromatography (table 1), mass spectrometry (table 1), and nuclear magnetic resonance spectroscopy (table 2) showed that all these peaks corresponded to paclitaxel derivatives. Three main paclitaxel metabolites resulted from hydroxylation reactions: 6α-hydroxypaclitaxel (peak P5), p-hydroxyphenyl C3′-paclitaxel (peak P4), and dihydroxypaclitaxel (peak P3). Dihydroxypaclitaxel, resulting from two hydroxylation reactions, was chemically identified by mass spectrometry and, for the first time, by NMR spectroscopy. Using reference derivatives, three of the seven minor paclitaxel metabolites were also identified by HPLC/mass spectrometry (table 1): 10-deacetylpaclitaxel (peak P6) resulting from elimination of the acetyl group at the position 10 of the taxane ring, and 10-deacetylbaccatine III (peak P1) and baccatin III (peak P2) resulting from the removal of the acetyl group at the position 10 of the taxane ring and of the side chain in C13 (fig. 2). β-Glucuroconjugated and sulfated derivatives were undetectable. HPLC analysis of extracted bile sample from a patient treated with paclitaxel (135 mg/m2, administered as a 3-hr iv infusion). (A) HPLC tracing of bile collected from 6 to 12 hr after the end of the infusion. Peaks representing paclitaxel (P) and predominant biliary metabolites are depicted. P1, deacetyl-baccatine III; P2, baccatine III; P3, dihydroxypaclitaxel; P4,p-hydroxyphenyl-C3′-paclitaxel; P5, 6α-hydroxypaclitaxel; P6, 10-deacetylpaclitaxel; docetaxel was used as internal standard (I.S.). All other minor peaks (*) showed UV spectra and characteristic fragment ions of paclitaxel derivatives, but their chemical structure remained unidentified. 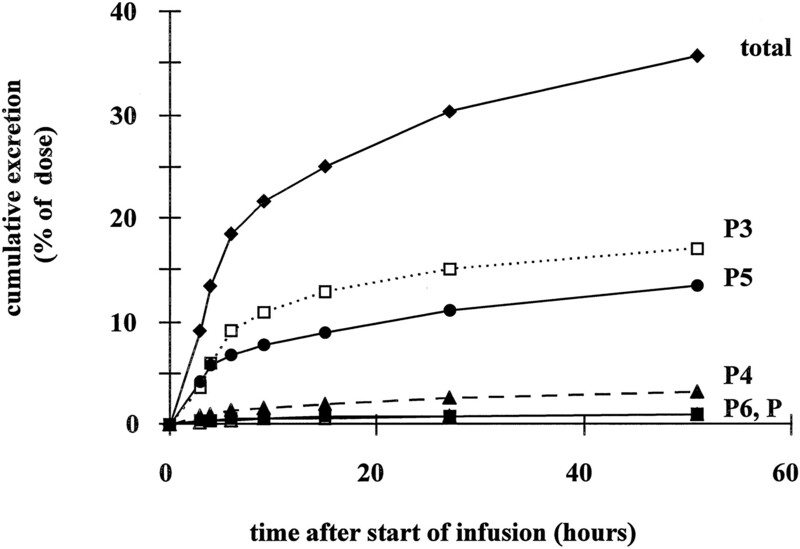 (B) HPLC tracing ofbile control during 30 min before the beginning of the infusion. 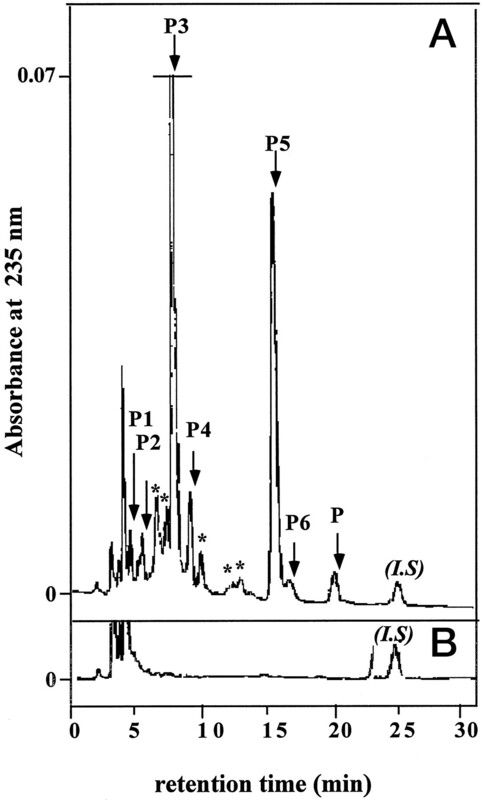 In plasma, among the different absorption peaks (fig.3 and table 1), unchanged paclitaxel and four paclitaxel derivatives were characterized by LC/MS coupling: 6-α hydroxypaclitaxel, p-hydroxyphenyl-C3′-paclitaxel, dihydroxypaclitaxel, and 10-deacetylpaclitaxel. In urine, apart from these four metabolites, we also characterized baccatin III and 10-deacetylbaccatin III. No β-glucuroconjugated and sulfated derivatives were detected (data not shown). HPLC analysis of a plasma sample from a patient treated with paclitaxel (135 mg/m2, administered as a 3-hr iv infusion). HPLC chromatogram of plasma control obtained before the beginning (B) and 30 min after the end (A) of the infusion. Peaks representing paclitaxel (P) and predominant plasma metabolites are depicted. P3, dihydroxypaclitaxel; P4,p-hydroxyphenyl-C3′-paclitaxel; P5, 6α-hydroxypaclitaxel; P6, 10-deacetylpaclitaxel; docetaxel was used as internal standard (I.S.). Pharmacokinetics of Paclitaxel and Its Metabolites in Plasma, Bile, and Urine. The plasma concentration vs. time profiles of paclitaxel and its four main metabolites are shown in fig.4 and table3. Unchanged paclitaxel (P) predominated during the infusion period, but thereafter, dihydroxypaclitaxel was the major species (P3). Paclitaxel plasma clearance and the apparent terminal half-life were 18.8 liters/hr (174 ml/min/m2) and 10.4 hrs, respectively. 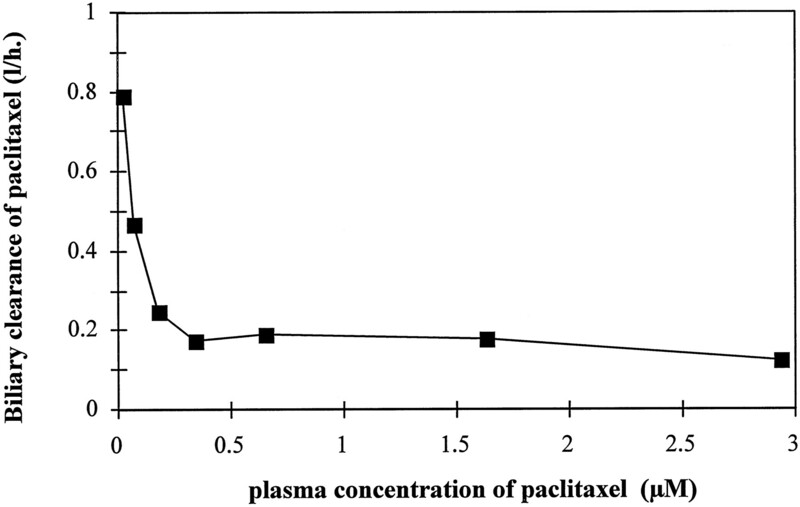 Plasma concentration-time profiles of paclitaxel and paclitaxel metabolites. From the concentrations of the different paclitaxel metabolites in the successive bile samples, we calculated the time course of their cumulative biliary excretion (fig. 5). During the infusion period (0–3 hr) the 6α-hydroxypaclitaxel (P5) was the major metabolite. Subsequently, dihydroxypaclitaxel (P3) became the main biliary metabolite. The overall amount of dihydroxypaclitaxel recovered in the bile accounted for 16% of administered dose of paclitaxel, whereas the 6α-hydroxypaclitaxel (P5) accounted for 12.9% (table 3). Paclitaxel (P) and the two other metabolites (P4, P6) represented only 4.8% of the administered dose of paclitaxel. Plotting the biliary clearance of paclitaxel over the different time intervals of collection against mean plasma concentration in this interval showed that clearance increased from 0.12 to 0.79 liters/hr, whereas mean plasma concentrations fell from 2.9 μM to 0.017 μM (fig.6). Cumulative biliary excretion of paclitaxel and paclitaxel metabolites. The cumulative amount excreted in bile is expressed as the percentage of the initial amount of infused paclitaxel. P, paclitaxel; P3, dihydroxypaclitaxel; P4,p-hydroxyphenyl-C3′-paclitaxel; P5, 6α-hydroxypaclitaxel; P6, 10-deacetylpaclitaxel. Biliary clearance of unchanged paclitaxel vs. plasma concentrations of paclitaxel. The cumulative urinary excretion of paclitaxel (P), P3, P4, P5, and P6 metabolites in the 48-hr collection period accounted for 3% of the administered dose (table 3). The total cumulative urinary and biliary excretion of paclitaxel and paclitaxel metabolites (P3, P4, P5, P6) 24 and 48 hr after the end of infusion were 29 and 36%, respectively. Biliary excretion of paclitaxel and of its metabolites has been previously reported in two patients (Harris et al., 1994;Monsarrat et al., 1993). In both cases, 6α-hydroxypaclitaxel was the main paclitaxel metabolite. Although paclitaxel disposition was determined in the bile of one of these patients, lack of data on the plasma and urinary concentrations of paclitaxel precluded a complete analysis of paclitaxel disposition. In contrast with these previous observations, we quantified paclitaxel and its metabolites in the plasma, bile, and urine of a third patient. We demonstrated that biliary clearance of paclitaxel is saturable. Moreover, this patient exhibited a quantitatively different metabolic pathway due to modified activity of hepatic cytochrome P450. Paclitaxel plasma clearance and half-life were comparable with those reported in patients on the same treatment schedule (Beijnen et al., 1994; Gianni et al., 1995; Huizing et al., 1993; Kearns et al., 1995; Rowinsky, 1997;Sonnichsen and Relling, 1994; Sonnichsen et al., 1994). Biliary clearance of unchanged paclitaxel increased continuously from 0.12 liters/hr during the infusion to 0.79 liters/hr at the end of the study (fig. 6). A delay for biliary excretion could explain the low initial value but could not account for the progressive increase values. The increase in paclitaxel biliary clearance concomitant with the decrease in the plasma concentrations was thought to reflect a saturable process, either of the hepatocyte influx or secretion of paclitaxel into the biliary canaliculi. Nonlinear elimination of paclitaxel has been ascribed from the more than proportional increase in plasma AUC with increasing dosage (Gianni et al., 1995;Sonnichsen and Relling, 1994; Sonnichsen et al., 1994) or by comparing the AUC values observed after a 3-hr infusion with those observed after a 24-hr infusion (Ohtsu et al., 1995). Moreover, the plasma concentrations of paclitaxel were better fitted by a Michaelis-Menten process rather than by a linear elimination process (Gianni et al., 1995; Sonnichsen and Relling, 1994). For the first time, nonlinear elimination was demonstrated by comparing plasma and biliary concentrations determined at the same times. Recently,Sparreboom et al. (1996) have shown in mice that Cremophor EL, a pharmaceutical vehicle of paclitaxel, is a principal determinant in the nonlinear pharmacokinetic behavior. One may surmise that impairment of biliary secretion of paclitaxel by Cremophor EL is due to reversal of the P-glycoprotein located in the epithelium of liver biliary canaliculi. The plasma AUC of all the metabolites, except dihydroxypaclitaxel, were low compared with paclitaxel AUC, indicating that these compounds were mainly excreted in bile. As demonstrated previously, biliary elimination constituted the main route of excretion; after administration of 135 mg/m2 paclitaxel for 3 hr, 29% of the administered dose was recovered in a 24-hr bile collection period, in line with other published data (Monsarrat et al., 1993; Wright et al., 1995). However, the metabolic profiles were significantly different; whereas the amounts of unmodified paclitaxel (3 and 0.9%, respectively),p-hydroxyphenyl-C3′-paclitaxel (2 and 2.2%, respectively), and 6α-hydroxypaclitaxel (12 and 11%, respectively) were similar, dihydroxypaclitaxel represented 2.5% of the administered dose in the first patient and 14.2% in this patient. Although few biliary data are available, several in vitrostudies have shown that paclitaxel is extensively metabolized in human by liver cytochrome P450 enzymes with marked interindividual variability. All metabolites so far characterized have been found to be less cytotoxic than paclitaxel itself (Harris et al., 1994a;Kumar et al., 1995; Monsarrat et al., 1993;Sparreboom et al., 1995; Wright et al., 1995). In most cases, 6α-hydroxypaclitaxel constituted the major metabolite with p-hydroxyphenyl-C3′-paclitaxel as a minor metabolite (Cresteil et al., 1994; Harris et al., 1994b;Monsarrat et al., 1993; Sonnichsen et al., 1995;Wright et al., 1995). Dihydroxypaclitaxel, an inactive metabolite (Sparreboom et al., 1995), is formed by successive hydroxylation of position 6 of the taxane ring by the P450 cytochrome 2C8 and the para-position of the phenyl at C3′ of the side chain in C13 by the P450 cytochrome 3A4 (fig. 1). In most in vivo and in vitro studies,dihydroxypaclitaxel was barely detectable because hydroxylation by the P450 cytochrome 3A4 was low and produced littlep-hydroxyphenyl-C3′-paclitaxel. Thus, the presence of large amounts of dihydroxypaclitaxel in the bile and in the plasma may stem from an induction of the P450 cytochrome 3A4, although induction of other cytochromes cannot be ruled out. It has been reported that the urinary excretion of 6β-hydroxycortisol, the major unconjugated metabolite of endogenous cortisol, constitutes an index of the induction of CYP3A4 in humans (Ged et al., 1989; Lykkesfeldtet al., 1994). Quantification of 6β-hydroxycortisol and cortisol in the urine of this patient demonstrated the presence of 890 ng/ml 6β-hydroxycortisol and 36 ng/ml cortisol. Thus, the 6β-hydroxycortisol to cortisol ratio was 5- to 10-fold higher than the normal limit. Alteration of this ratio is indicative of an increase in cytochrome P450 3A4 activity that could account for the profound modification of the metabolism of paclitaxel in this patient. It should be noted that a corticoid (methylprednisolone) was administered for 14 days before administration of paclitaxel to this patient. The action of this substance, an inducer of CYP3A (Anderson et al., 1995;Cresteil et al., 1994), could account for the enhanced metabolism of cortisol and the increased hydroxylation of the phenyl at C3′ of paclitaxel, which was rapidly converted to the dihydroxylated and inactive metabolite. The action of corticoids could also account for the reduced urinary elimination of paclitaxel and paclitaxel metabolites (3%) in this patient compared with higher values (10–15%) determined in previous patients (Rowinsky, 1995, 1997;Sonnichsen and Relling, 1994; Walle et al., 1995). In conclusion, our findings point to a determinant role of cytochrome P450 enzymes in taxoid metabolism and suggest that further studies are needed to appreciate to what extent their induction may affect paclitaxel clearance and pharmacodynamic. We thank Dr. S. Arbuck of the National Cancer Institute for her assistance in obtaining Paclitaxel. Send reprint requests to: Dr. Monsarrat Bernard, Institut de Pharmacologie et de Biologie Structurale, Centre National de la Recherche Scientifique, 205 route de Narbonne, 31077 Toulouse Cedex, France. This work was supported by a grant from l’Association pour la Recherche sur le Cancer and the Conseil Régional of Midi Pyrénées. Part of this research was presented previously at the 88th Annual Meeting of the American Association for Cancer Research in San Diego, CA. (1995) Dexamethasone induction of taxol metabolism in the rat. Drug Metab Dispos 23:1286–1290. Beijnen JH, Huizing MT, Ten Bokkel Huinink WW, Veehof CHN, Vermoken JB, Giaccone G and Pinedo HM (1994) Bioanalysis, pharmacokinetics, pharmacodynamics of the novel anticancer drug paclitaxel (taxol).Semin Oncol 21(Suppl. 8):53–62..
(1995) Effect of R-Verapamil on the pharmacokinetics of paclitaxel in women with breast cancer. J Clin Oncol 13:2039–2042. (1994) Taxol metabolism by human liver microsomes: Identification of cytochrome P450 involved in its biotransformation. Cancer Res 54:386–392. (1989) The increase in urinary excretion of 6β-hydroxycortisol as a marker of human hepatic cytochrome P4503A induction. Br J Clin Pharmacol 28:373–387. (1995) Nonlinear pharmacokinetics and metabolism of paclitaxel and its pharmacokinetic/pharmacodynamic relationships in humans. J Clin Oncol 13:180–190. (1994a) Isolation, structural determination, and biological activity of 6 α hydroxytaxol, the principal human metabolite of taxol. J Med Chem 37:706–709. (1994b) Metabolism of taxol by hepatic microsomes and liver slices: Participation of cytochrome P450 3A4 and an unknown P450 enzyme. Cancer Res 54:4026–4035. (1993) Pharmacokinetics of paclitaxel and metabolites in a randomized comparative study in platinum pretreated ovarian cancer patients. J Clin Oncol 11:2127–2135. (1995) Metabolism of taxol by human and rat liver in vitro: A screen for drug interactions and interspecies differences. Cancer Chemother Pharmacol 36:107–114. Kearns CM, Gianni L and Egorin MJ (1995) Paclitaxel pharmacokinetics and pharmacodynamics. Semin Oncol 22(Suppl. 3):16–23..
(1994) Cytochrome P450 3A mediated human liver microsomal taxol 6 α hydroxylation. J Pharmacol Exp Ther 268:1160–1165. (1995) Comparative in vitro cytotoxic effects of taxol and its major human metabolite 6 α hydroxytaxol. Cancer Chemother Pharmacol 36:129–135. (1994) Simultaneous determination of urinary free cortisol and 6β-hydroxycortisol by high performance liquid chromatography to measure human CYP3A activity J Chromatogr B 660: 23–29. (1990) Taxol-metabolism: Isolation and identification of three major metabolites of taxol in rat bile. Drug Metab Dispos 18:895–901. (1993) Hepatic metabolism and biliary excretion of Taxol in rats and human. J Natl Cancer Inst Monogr 15:39–46. (1995) Clinical pharmacokinetics and pharmacodynamics of paclitaxel: A 3-hour infusion versus a 24 -hour infusion. Clin Cancer Res 1:599–606. (1995) Phamacology and metabolism. in Paclitaxel in Cancer Treatment, eds McGuire WG, Rowinsky E.K (Dekker, New York), pp 91–120. (1997) The development and clinical utility of the taxane class of antimicrotubule chemotherapy agents. Ann Rev Med 48:353–374. (1989) Clinical Pharmacokinetics. (Lea & Febiger, Philadelphia). (1995) Paclitaxel (taxol) metabolites in human plasma and urine: Identification of 6α-OH taxol, 7epitaxol and taxol hydrolytics products using liquid chromatography/atmospheric-pressure chemical-ionisation mass spectrometry. Rapid Commun Mass Spectrom 9:495–502. (1996) Metabolism of docetaxel by human cytochromes P450: Interactions with paclitaxel and other antineoplastic drugs. Cancer Res 56:58–65. (1995) Pretreatment H2 receptor antagonists that differ in P450 modulation activity: Comparative effects in paclitaxel clearance rates and neutropenia. Cancer Chemother Pharmacol 36:227–232. (1994) Clinical pharmacokinetics of paclitaxel. Clin Pharmacokinet 24:256–269. (1994) Saturable pharmacokinetics and paclitaxel pharmacodynamics in children with solid tumors. J Clin Oncol 12:532–538. (1995) Variability in human cytochrome P450 paclitaxel metabolism. J Pharmacol Exp Ther 275:566–575. (1995) Isolation, purification and biological activity of mono and dihydroxylated paclitaxel metabolites from human feces. Cancer Chemother Pharmacol 36:299–304. (1996) Nonlinear pharmacokinetics of paclitaxel in mice results from the pharmaceutical vehicle Cremophor EL. Cancer Res 56:2112–2215. (1995) Taxol metabolism and disposition in cancer patients. Drug Metab Dispos 23:506–512. (1995) Metabolism and pharmacology of taxoids. in The Chemistry and Pharmacology of Taxol and Its Derivatives, ed Farina V (Elsevier, New York), pp 131–164.